Jan wanted to try out her new Instant Pot today, but decided to ease into it by first making a batch of her world-famous Chili using it in the slow cooker mode. Rather than a list of ingredients, how about a photo? 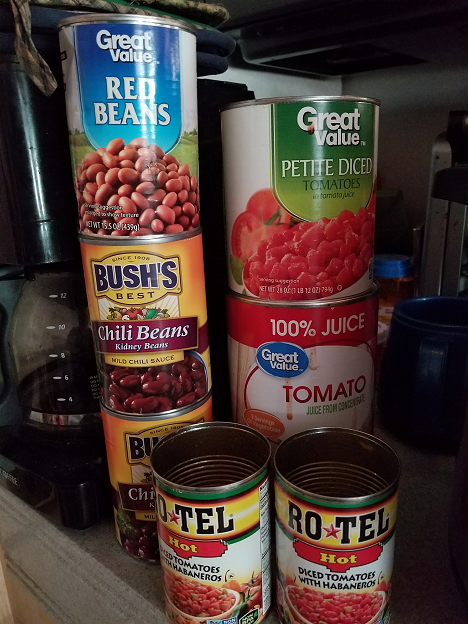 Actually we ended up two more cans of beans after seeing the level in the pot. The cans in the photo pretty much filled up our 5 qt. Hamilton Beach Slow Cooker, but the 8 qt. IP had more room. In getting this meal going I ran into a couple of problems (annoyances?) with the IP. First off, in Slow Cooker mode anyway, you can’t change the cooking temperature, Less, Normal, More, while you’re actually cooking. You have to shut off the IP and then start all over again. Nor can you change the cooking time, say to add a hour. Again you have to start over. The other problem is with the cooking temperature itself. It’s too low on all three settings. After an hour on Low today, the chili wasn’t even warm, but it would have been in our old H-B Slow Cooker. So next I rebooted the IP and set it for More. And after about three hours it was warm enough to eat. But after three hours in our old H-B it would be boiling. So I guess we’ll have to adjust our times and temps with the IP. Or just keep using the H-B for slow cooking, since Jan want’s to keep it anyway. About 2pm Jan and I headed out to check out another couple of RV parks in the area, one new one to us, and one old favorite. First up was Green Caye RV Park over in Dickinson, just north of FM517. We’ve never stayed here but it’s supposed to be pretty nice so we thought we’d check it out. Turned out to be very nice, but kind of a weird layout, like a giant ‘T’, woven around the park models, apartments, and homes. When I saw the cost, $485 per month, I thought that was kind of high until I looked closer and found it also includes electric. Pretty unusual for a monthly rate. And not a bad deal after all. Then it on over to Galveston Bay RV Park, the park where we spent every winter from 2008 through 2013. Then it seem to be almost impossible to get a reservation, and we haven’t been back since. And that’s when we started spending the winter bouncing between the Lake Conroe TT and the Colorado River TT in Columbus, TX. This was our site the first two years, Site 80. But since then a new RV Park was built right next door, so this is the view now. And this is site 75, where we stayed in 2011. When we stayed here, we pulled in instead of backing in so we could have the bayou view out the windshield. Then we just hooked up to the pedestal underneath the rig. And it looks like they’re getting ready to open a whole new area on the north side of the park. Coming home we made a quick stop at the Kroger’s on Hwy 96 before heading back to the rig. If the earth were really flat, cats would have pushed everything over the edge by now.